The San Diego Urban Rural Roundtable developed a comprehensive set of recommendations to move San Diego closer to a sustainable regional food system.The project time frame was March to June 2011. The San Diego Urban-Rural Roundtable brought together over 100 leaders and stakeholders from around the San Diego region to develop a set of recommendations aimed at building a healthy, fair, economically thriving, and environmentally sustainable food system for all residents of San Diego County. Their recommendations built on the work of the San Diego Food System Working Group, the County Health and Human Services Agency, the Healthy Works initiative, and scores of other governmental, private sector, and community efforts. The Roundtable’s deliberations were informed by the recent San Diego Food System Assessment produced by the Food System Working Group in partnership with the UC Davis Agricultural Sustainability Institute. Policy actions are a primary focus of the recommendations, but the recommendations also point to areas where business, academic, and community leadership are critical. 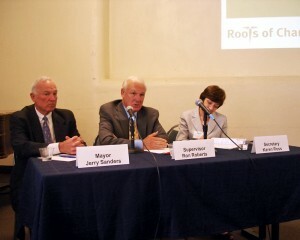 Roundtable participants presented their recommendations to San Diego Mayor Jerry Sanders, County Supervisor Ron Roberts, and Secretary of the California Department of Food and Agriculture, Karen Ross on June 6, 2011. The Roundtable agreed that the City and County should adopt a comprehensive set of food system policies, align the political strength of the region to advocate for key regional, state and federal policies, and support implementation through the creation of a Food Systems Alliance. Below are the 5 specific goals that emerged as top priorities for the community. Build a broad coalition of urban and rural, business and community interests to support subsidization of a pricing differential for water used for food production to help local growers stay in business and meet residents’ goal of increased local food access and consumption. Invest in local and regional food system infrastructure to connect local producers to local markets, create jobs, and recirculate food dollars in the local economy. Adopt procurement policies and nutrition standards that make healthy, fair, sustainable, locally grown foods accessible to all residents in the region at prices that are profitable for local farmers. Strengthen policies and programs to ensure that all San Diego residents have access to healthy, affordable, and culturally appropriate foods at all times, including times of emergency. Develop and support community garden, school garden, backyard farming, and cooking programs for all ages to provide hands-on education and training on food production and nutrition as well as direct access to fresh produce. More detail is available in the full report, Final Recommendations of the San Diego Urban-Rural Roundtable, located below. Please note, that the report is available both in Spanish and English. Special thanks to USDA Risk Management Agency for their continued support of the Urban-Rural Roundtable process. Error: Error validating access token: Session has expired on Tuesday, 26-Mar-19 12:54:16 PDT. The current time is Sunday, 21-Apr-19 07:35:18 PDT.